If you haven’t yet, meet the beautiful Ficus Lyrata. 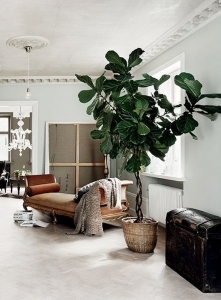 Commonly referred to as the Fiddle Leaf Fig, this popular indoor plant has been sensationalized over the past few years. 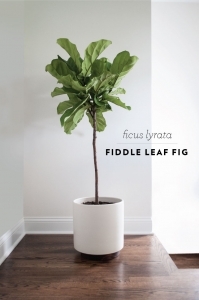 Thanks to countless features in popular design magazines, blogs, and social media the Ficus Lyrata has been catapulted into plant stardom… But why? The Lyrata gives off a simplistic & modern plant design that pairs nicely with neutral colors and trendy interior decorations. Its big, waxy, dark green, violen-shaped leaves demand your eye’s attention and the skinny trunk finds its way into the soil every so gently. The best part is, the bigger they get, the cooler they look. A plant so beautiful as this, what could go wrong? Well, a lot could go wrong and we’re here to help you take care of your new or current Ficus Lyrata to avoid any plant disasters. Of course, every plant requires light in order to grow. But, the Ficus Lyrata requires a special kind of light to thrive and grow into a large mature plant. Indirect sunlight is best. Placing your Lyrata near a window or skylight will ensure it has enough light to remain healthy in your environment. Avoid any direct sunlight, as it could stunt it’s growth or even kill the plant. Rotation is also key! You will quickly notice your Lyrata will tend to bend and reach towards the light. Rotate the plant so it needs to bend the opposite way. This will ensure it grows tall and straight. Another no brainer… Of course your Fiddle Leaf Fig requires water to survive. However, too much water will kill it. Best practice is to stick your fingers a few inches into the soil to see how dry or wet it is. If the soil is dry a few inches down, go ahead and water your Lyrata. If you feel that the soil is moist, hold off on watering until the soil is dry. Do not let your Lyrata sit in water for more than a day or two. Watering with room temperature or lukewarm water is best. The ideal temperature for your Lyrata to live in is: 55º-85ºF. Any setting below 55ºF will not suffice. Plan on re-fertilizing your Lyrata once or twice a year. Specifically with rich, well-drained peaty soil. Once your Fiddle Leaf outgrows it’s pot/container, the roots will begin to become crowded and actually grow through the drainage hold. This can cause circulations issues and even root rot. Give your Lyrata a new home so it can grow to it’s true potential! Wiping down your Lyrata is a MUST! Those big leafs do a great job of collecting dust, which can prevent the plant from absorbing sunlight and key nutrients. Using a damp cloth, wipe down the leaves on your Lyrata once a month. Not only will this ensure it says healthy, but looking great as well. Now that you know what it takes to keep your precious Fiddle Leaf Fig in good shape, what are you waiting for? 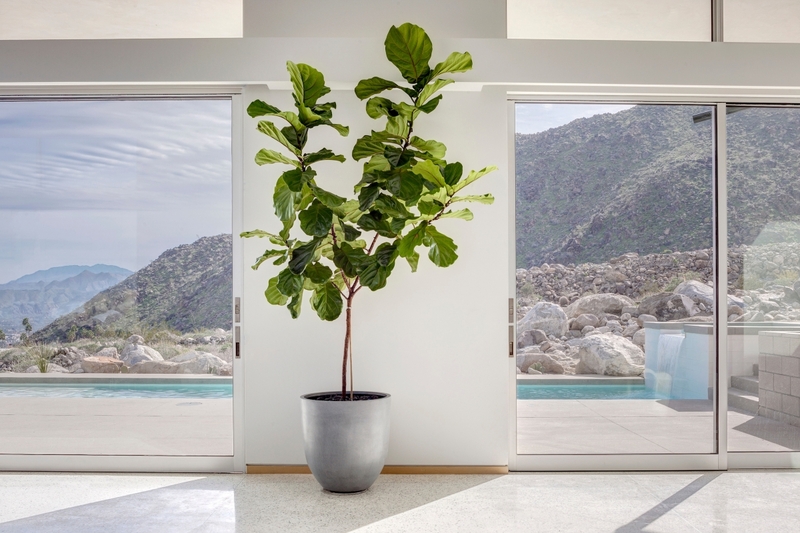 If you need any further assistance, or would like to explore design options to decorate your space with a Ficus Lyrata, please contact sales@plantscapers.com and we’d be happy to assist.